The Federal Court has informed the attorney representing the wedding industry of his decision regarding beach permit requirements. Sadly, his decision was in favor of the state. We haven't seen the ruling yet (we should have it tomorrow) but will post it on our website as soon as it's available. More details will follow as soon as we receive them. In the meantime, a heartfelt thanks to associations and individual companies on Kauai, Oahu and here on Maui, for their active participation in this effort. And...it isn't over yet. Again, more details will be provided as soon they are available. BETTER LATE THAN NEVER - A Love Story. For 60 years Shirley & Robert didn't know they were neighbors, living only a quarter mile from each other in quite rural Oshkosh Wisconsin. They married, had families, and lived their lives. It wasn't until after all the children had moved away, and Shirley's husband passed, that Robert & Shirley met, just 1 1/2 years ago. 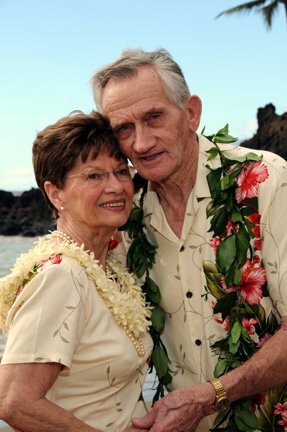 Shirley & Robert were married on Valentine's Day 2010 at Makena Surf Beach... Congratulations to both of you, we wish you all the happiness that life has to offer!